of my Thanksgiving Table Setting ideas. Plus, my table actually ended up being kinda Christmas"y"
so the centerpiece could be used as a Christmas Table Centerpiece too. The table cloth & red napkins are from Walmart, and the gold napkins are from Tuesday Morning. My family had a memory night for him this month, and the quote was found, once again. When God gives it, It is precious! 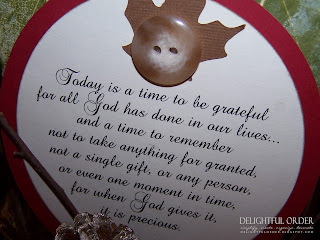 Hope your Thanksgiving was truly blessed! 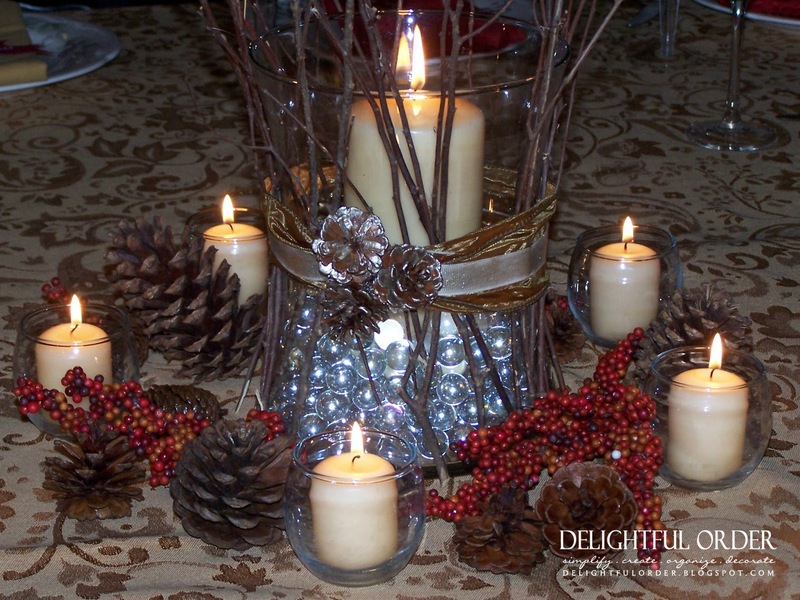 I love your centerpiece because I think the idea of using natural materials from the yard is so terrific. Lovely table and such a personal quote. A great & smart idea! 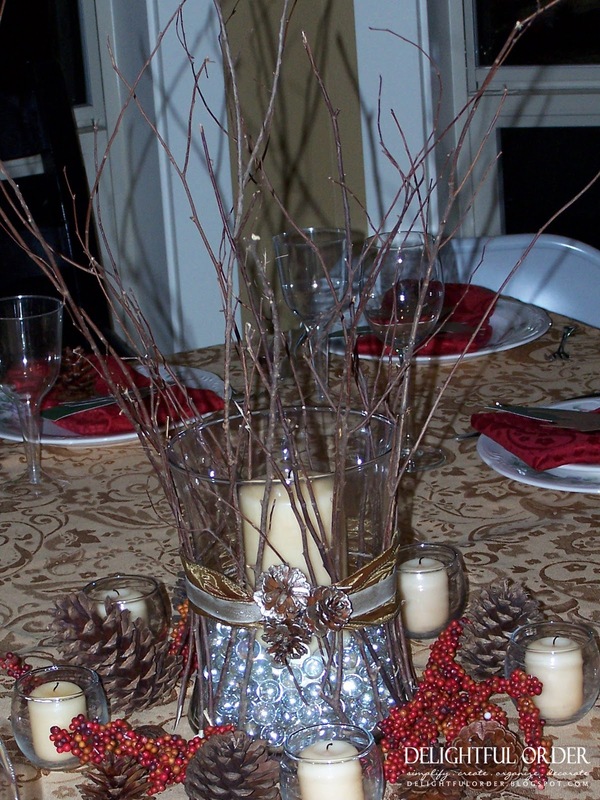 Love your centerpiece. Very original. So pretty--love the poem. Thanks for linking up! You have some gorgeous ideas. I haven't tried painting pine cones, but I really like yours. The quote is one we should all remember! Oh your table is beautiful! LOVE the twigs and I am a HUGE pinecone fan. Made ornaments last year to cover my tree in pinecones and a pinecone 'tree' like one I had seen in Target. I even used them again this year on my mantle. I can't get enough of them. I am loving bringing in nature. I'm a new visitor and can't wait to browse your blog. how great! 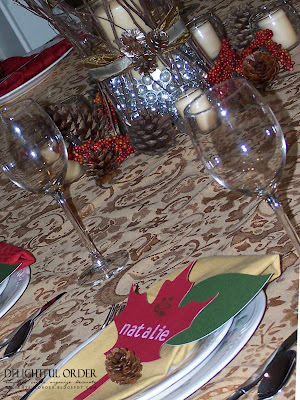 i love the centerpiece and the leaf place setting! This is such a great idea! They look gorgeous! Thanks a lot for linking up and sharing it with us. Beautiful! 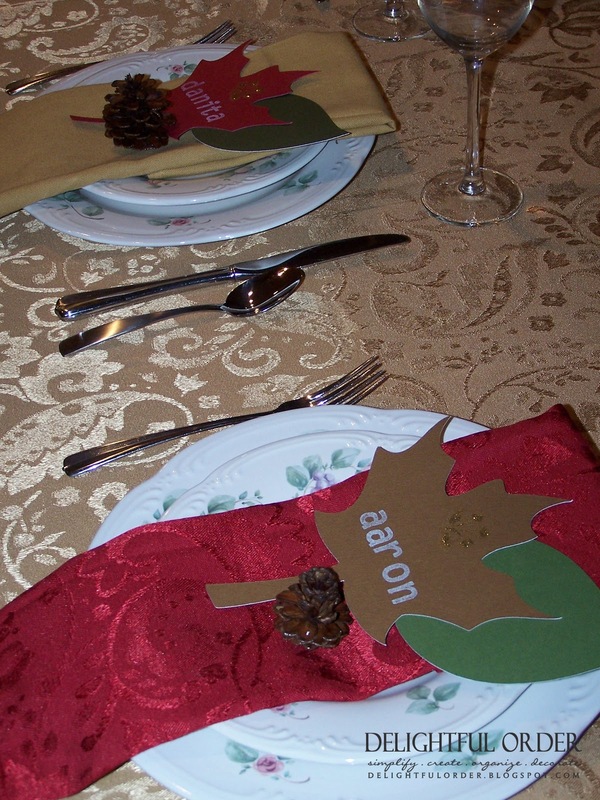 Love the napkins and tablecloth. The personal touches you added are perfect!!!! Wonderful table, so cozy and inviting. I love the rustic feel of your centerpiece!! Actually reminds me a a sort of winter wonderland. Very nice! Love your idea...so natural...cheap but chic. 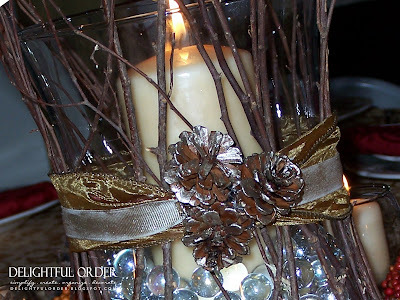 Also posted on my blog other ideas with tree branches. Check it out.